At this stage of the game WPF Validation is still a work in progress. The problem is that the current model of validation confuses data validation with data binding. This leaves the typical Dialog Box creator with a dilemma. 1. Do it yourself (back to Access, move the code to the form, validate it and move it back again). 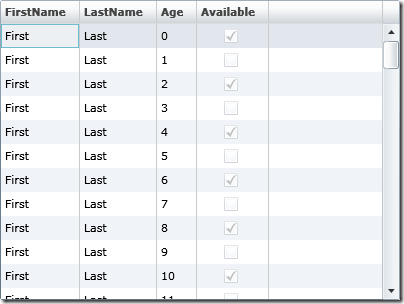 using UpdateSource on the binding expression when the user clicks OK. This works in that no changes are made to the model until you say so. However, all validation has to be performed manually when the OK button is clicked. and cost price immediately reflect the new value). Yet again, more explicit code to update these properties independently of data binding. is updated as part of the validation process and you need to back out the users changes if they click the Cancel button. This is unacceptable. In my data model changing some properties causes extensive UI changes which should just not be happening until the user confirms the update. to avoid the tedious coding. The current situation is untenable, with no clear solution and conflicting advice on all sides. No one appears to have taken the time to reply to your comments, so I’ll do so now. BindingGroup does offer part of the solution you are looking for, but you should also being pairing it with another 3.5 SP1 feature: ValidationStep. If you use the default ValidationStep (which preserves pre SP1 behavior), then you will have a combinatorial explosion in the number of value converter objects you must write. Furthermore, it limits your ability to dynamically load value converters and therefore replace existing value converters depending on context. Unfortunately, ConverterParameter still cannot be dynamically bound to, and therefore there is still yet another source of code that can result in combinatorial explosion of classes being written to accomplish trivial tasks. There is yet another scenario you might not have thought of that is much harder than it should be: Navigation. In particular, hard state versus soft state. Currently, WPF determines for you what it considers hard state and what it considers soft state. To some extent, this is a good thing, since it roughly approximates how the Web works. However, as Steffen Meschkat and Josh Mittleman have pointed out in their Human Computer Interaction 2007 & 2008 Conference Workshops, sometimes you need some additional control over what hard and soft state is, building on top of the History and Bookmark navigational model of the Web. In WPF, this hard-vs.-soft dichotomy does not exist by default, so you have to build it. However, doing so is a challenge because NavigationWindow does not expose its internals; the design of the entire navigation mechanism at release was pretty bad, all the way down to the ugly default browser bar that makes me hurl just looking at it. I’m hoping navigation will improve, including adding the ability to determine the data structure for the journaling mechanism. This would allow me to pick what kind of navigation I want to provide the user. For instance, fisheye, etc. Right now, WPF’s navigation design projects the feeling that no one at Microsoft has ever heard of Adaptive Hypermedia, or Object-Oriented Hypermedia User Interfaces. Eighteen months ago I stopped using Microsoft Development tools, having used MS tools since VB2 it was a big step. I fealt dissolusioned with MS’s attitude toward developers, anyway my absence took me to Java – they have the wonderful new JavaFX and with the pace of development at Sun we’ll look forward to trying it in about ten years! I have liked what Adobe have done with Flex & AIR and during 2008 I spent considerable time trying to re-write an old application and prototype a new one in Adobe AIR (I’m more of a desktop developer than a web developer). What line of business means to me is that when I have legacy applications – or ‘legacy clients’ 😉 They will ask if the new application I’ve developed for them can link to a legacy application or dip into an Excel file or Access db or some other thing that wasn’t in the original schema! I can’t say ‘No!’ to these clients and I have found that Adobe AIR is a long way from being fit for LOB development for this reason (I have been one of their beta testers). So since December I’ve come back to the MS fold and frankly I amazed at what MS have done with WPF – anyone doubting what MS have done ‘Don’t !’ if you have to develop ‘real’ applications they are miles ahead of the competition. I have also found that Microsoft’s attitude toward us ‘small – independant’ developers has improved. This subject “Is WPF ready for LOB ?” is so important for us as we are going to rewrite from scratch a huge application (C++/MFC) in .NET. But it is really difficult to have a clear answer even from MS. I think there is a marketing point of view and a technical point of view which may not be the same. If it’s true, we will use WinForms. My personal experience with performance is quite positive – I have re-developed a booking system that was originally developed in VB6. It is difficult to compare speeds between the old app and the new one because the new one is far richer graphically and this richness takes rendering and that takes time. However I have managed to reduce rendering time down now so that the new app takes only 600ms longer to render than the old one, this is rendering a scrollable grid with sometimes two thousand rendered objects populating the grid. The trade-off is how ‘rich’ your new app nees to be! I, for one am quite excited about WPF. I work in an industry that uses a lot of custom applications which are horrid to use because hacking together custom controls is not “cost effective”. I am hoping that a new age of application design is ushered in where finally looks and functionality are back on the priority list! I’m using WPF in a LOB right now. I have to say that my client is quite progressive in how they think about technology which made selling WPF as the technology to use easier. In coming from a mixed web and client background, I find the technology liberating from the shackles of making applications that look like Windows 3.1. It definitely opens a door to allow you to start thinking of new ways to visualize data and present it to users in ways that engage and encourage them. After all, thats what LOB apps should be for. Anyway, when I want to create a LOB application I rather go to SL instead of WPF. 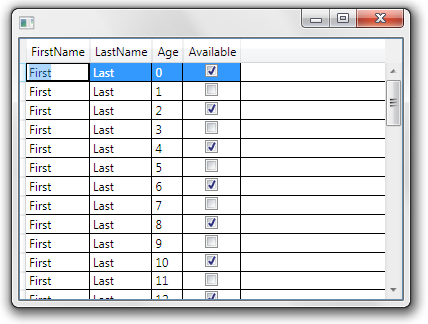 Windows forms is no longer being developed by Microsoft, but that’s largely irrelevant. As a platform, it is complete. It’s as much of a wrapper around GDI/GDI+ as it can be, enough for an enormous third-party control market. This is the reason most LOB applications are developed using windows forms. Will WPF catch up and even exceed its popularity? Absolutely! But it’s not there yet. There is still probably at least a hundred times as much development happening on windows forms as there is in WPF, and to call it “obsolete” as if it shouldn’t be considered is ill-advised.